With so many beautiful specimens to choose from in my archives, I truly had a hard time deciding which to include. The Atlas Moth (shown below) is my favorite. All those beautiful butterflies in one place - heavenly. So beautiful! I don't think there are any butterflies in that stage here yet. Too cold. What a wonderful place to be. I would have such a good time there! Butterflies are living, miniature works of modern art. Absolutely beautiful. I think it would be a place I would like to visit, RIGHT NOW! I just got back from a small vacation and need another one already. Someplace relaxing. It looks so zen-like. Wow! This is so cool! The Atlas moth is fabulous, like something from a fairy tale! I also love the black and red one. Good Morning, beautiful butterflies.. I love visiting the butterfly houses.. Lovely images, have a happy day! There was once a butterfly house at our Perth Zoo but my granddaughter told me the other day it has closed which seems such a shame. 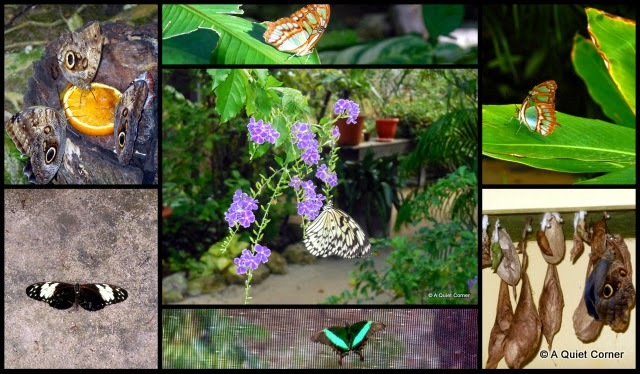 How exciting to visit a butterfly farm while in Aruba. Interesting to see the pins in use.